Green peppers that mature to blazing red color with flavor to match! 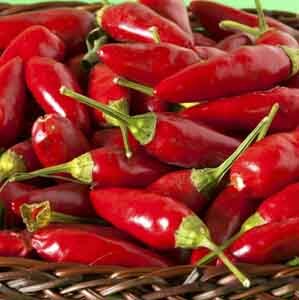 Spiciness increases with lean soil and minimal watering. The peppers are held upright on plant making this a colorful ornamental when it’s loaded with fruits. Perfectly sized for growing in patio pots. Excellent used fresh or dried for flavoring a variety of dishes. Perfect for adding zesty spiciness to Asian or Indian cuisine. Preserve by canning, drying, or freezing. Wash fruits, vegetables and herbs thoroughly before eating. Plant in a sunny location after the threat of frost has passed. Space plants 18" x 30" (45cm x 75cm) apart. Keep soil moist, watering freely in dry weather. Harvest as needed.